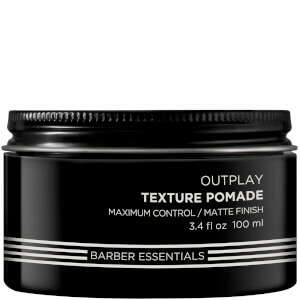 Its texture is amazing, really easy to style with, but it leaves your hair quite oily and shiny after a few hours. 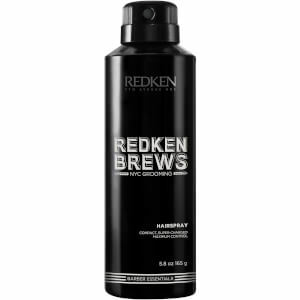 Great if you are using it only for a couple of hours, but terrible if you put it on for your 9 to 5 job If it were matte, it would be perfect..
Love Redken products and bought this for my husband whose hairdresser users...so much cheaper than at the salon! Good job Look Fantastic! I have alot of thick hair, and I've been using Work Hard for as long as I can remember. It does exactly what I need it to do, without making your hair hard, like some gels do. Sometimes, I do add a little Stand Tough for extra strong modelling. Work Hard works Best ! 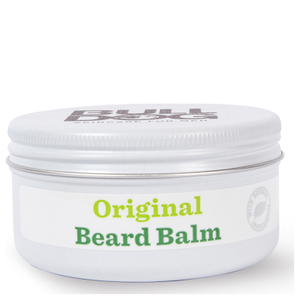 My husband uses this product regularly and loves the styling power without any stiffness. Looks natural. I am always asked to re-order when he gets near the end of the product. Very good high quality product! 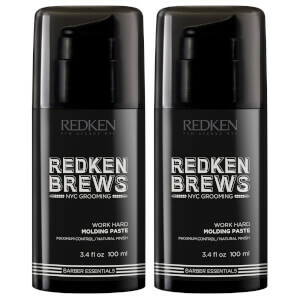 I have always liked RedKen for Men products, they are a good brand. This paste comes in a pump action bottle and usually 1 pump is enough. You can obviously use a bit more to get your desired style. The texture is really good and the hold I get from this is pretty strong. It won't leave your hair really hard to touch but it still gives it a strong hold. It is mostly a matte effect but could give you a small amount of shine depending on the amount you use. Even though this is my first bottle of this I will continue to buy. It's an extremely good product suits my hair well. Everyone's hair is different but if you think this will be good for your hair then don't be afraid to try it as the price is very reasonable. Perfect service from LookFantastic too! I have very fine blonde hair so have usually struggled with hair products that offer hold as well as leaving my hair looking like actual hair. Maybe I'm using it wrong, but this certainly doesn't do the latter. Great hold yeah, but my blonde hair was left looking dark brown because of the wet look it gave me... Admittedly I've only used it once, so will have to give it another go, but I'm disappointed that this was the outcome. This is awesome on fine, short hair. It actually makes my hair look thick which is cool. Love this product! Always fast delivery and excellent service from LookFantastic! Excellent product, excellent modeling and texturing hair. No Shine and oily hair. I have thin hair. I recommend.